From the limited sampling of plates we tried, I would say that Raku is worth a try. The signature Raku roll packed a strong savory base flavor with an amalgam of textures from soft to crunchy thanks to eel, tamago omelet, avocado, and cucumber. With a sliver of marinated ginger, each piece was a brought a rainbow of flavor into my mouth. The ‘Seoul’ Train roll triggered memories of Korean California rolls my mother used to make, the unifying ingredient being kimchi. 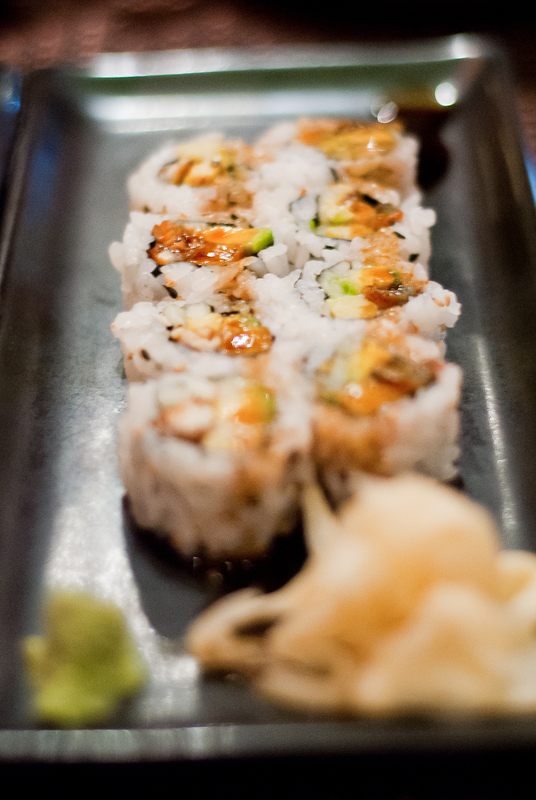 As a hard-to-miss ingredient, the kimchi gave the ‘Seoul’ Train roll a uniquely Korean flavor. Alas, the ‘Seoul’ Train roll lacked in sophistication that the Raku roll pulled off so nicely. Floating around somewhere in my mind is the name of the third roll, which was more traditional in the sense that it was not a specialty roll. Even so, this third roll appeased my inclination for savory foods by combining a healthy serving of salmon with crunch from a pea-sized dose of panko bread crumbs. 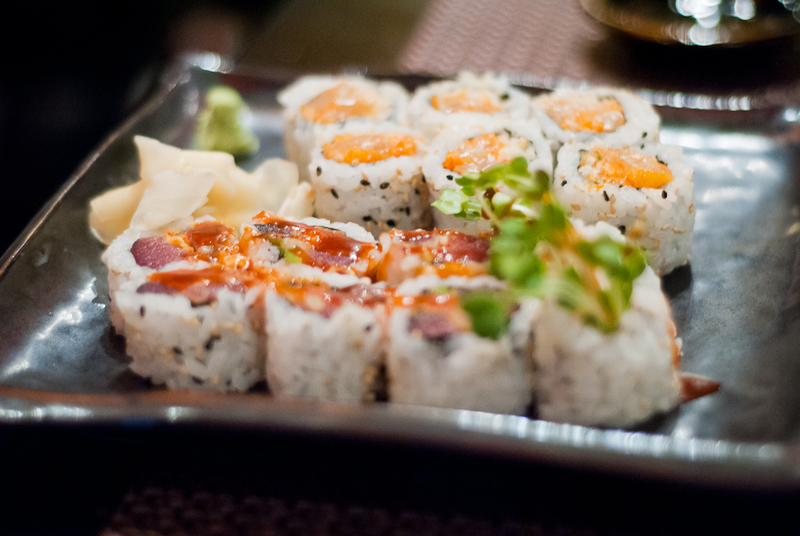 The strength of Raku lies not in its diverse and solid sushi lineup but its equally expansive selection of appetizers and entrees. 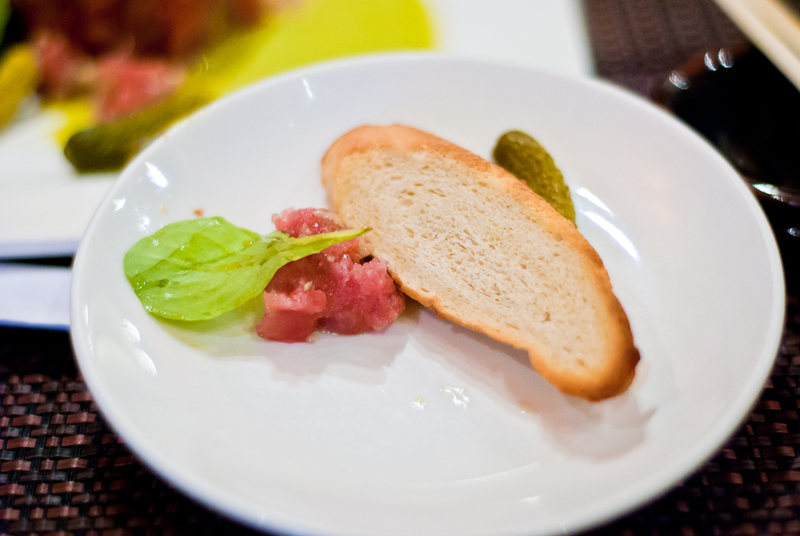 As a huge fan of the traditional French dish steak tartare, I had no choice but to order a tuna tartare. Though not similar in flavor to traditional steak tartare, the tuna tartare with lemon basil sauce piqued my interest for the food to follow. 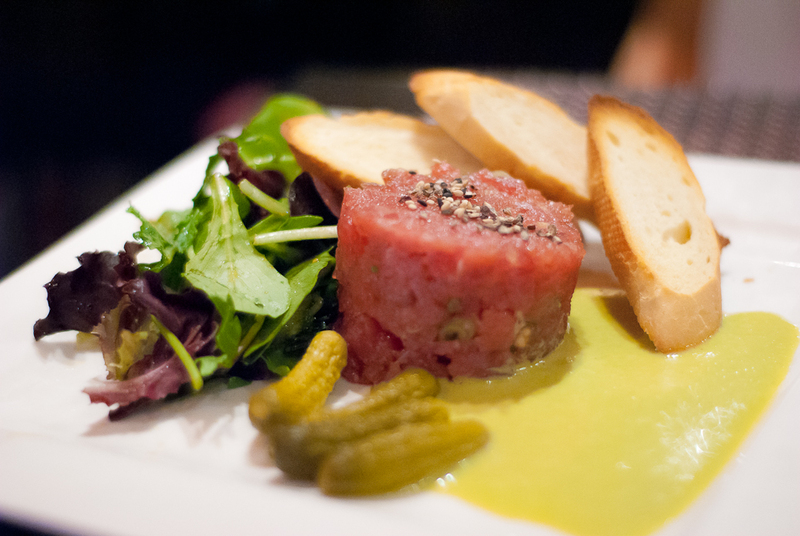 Raku’s tuna tartare is served with slices of toasted bread, dressed greens, and baby pickles that pack quite the punch. 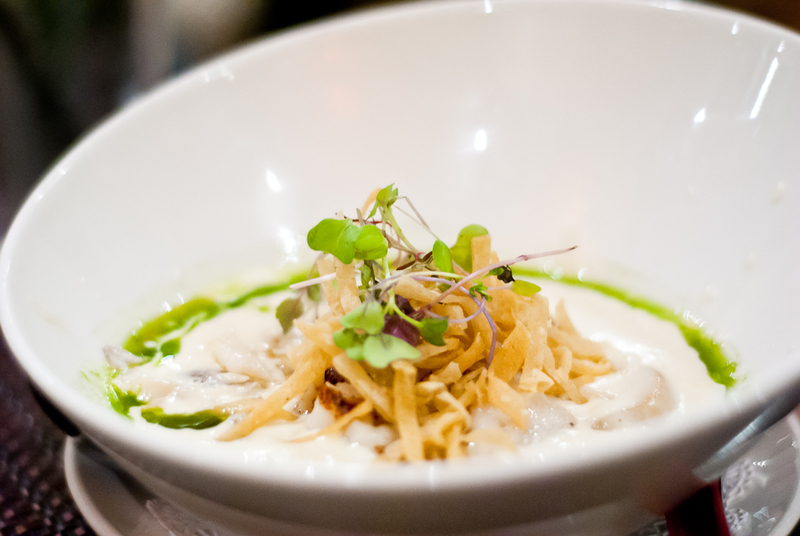 The Maine scallop with oyster ragout was mellow in taste and soft on the mouth, consisting primarily of scallops, mushroom, and a creamy white sauce. A bit of added kick in the sauce wouldn’t have hurt, but the main pitfall of this dish lay in the fact that the tortilla strings topping the dish got soggy too quickly to enjoy. After dinner at Raku, Sarah and I walked around the area a bit—which itself is quite charming—until we came across this gem of a dessert place called Dolcezza Artisanal Gelato. From the name, you can already anticipate the quality of its foods, and the gelato certainly lived up to its name. As an aside, I should confess that I rarely eat sweet foods and almost never eat stereotypical desserts, i.e. ice cream, cake, etc. It’s not that I don’t like the taste of these foods. I enjoy them just as much as anyone else. I simply avoid them as part of eating a healthy diet. The reason I digress is that because of this, my palate for sweet foods may not be as refined as it could be. I find most sweet treats quite delicious. However, I have an instinctive feeling that even self-proclaimed gelato connoisseurs would enjoy Dolcezza’s selection. The flavors are exotic, ranging from lemon opal basil to cucumber mint vodka, and they change weekly. You can find tried-and-true flavors too, such as espresso or salted caramel. The gelato itself is creamy, with little if any trace of large ice crystals. It melts in the mouth like butter, and the flavors, far from being dull, trigger memories of the ingredients they’re made of. For example, tasting the lemon opal basil gelato felt almost like biting down on a basil leaf.